This package no longer works and it shouldn't be used. Install the adobe-flashplugin package from the Ubuntu Partner repository (to enable it, open Software & Updates, on the Other Software tab) instead. 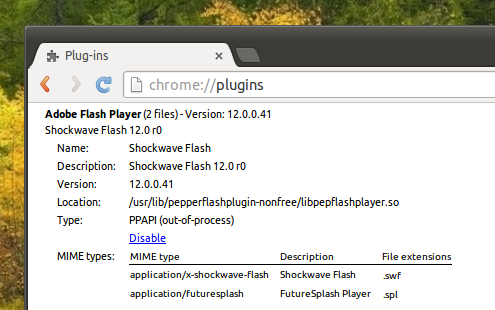 A Pepper Flash Player installer for Chromium browser has been added to the official Ubuntu 14.04 repositories. As many of you already know, the latest Adobe Flash Player is available for Linux only through Google Chrome while other browsers are stuck with version 11.2. Further more, Flash 11.2 will stop working in Chromium because it uses the Netscape Plugin API (NPAPI), which Chromium will stop supporting this year. For these reasons, an Adobe Flash Player Pepper installer has been added to the official Ubuntu 14.04 repositories, imported from Debian. This installer downloads Google Chrome, unpacks it, extracts Pepper Flash and sets it up so it can be used in Chromium browser. Update: the package can install Pepper Flash on 64bit only! The installer can be used to install Pepper Flash Player from either Google Chrome Stable, Beta or Unstable. I don't know if this installer will be ported for older Ubuntu versions but if you use an older Ubuntu version, you can already use a PPA that does pretty much the same thing. For more information about this PPA and how to install Pepper Flash Player for Chromium on older Ubuntu versions, see: Install Pepper Flash Player For Chromium In Ubuntu Via PPA. Thanks to towpik for the tip!